just to keep folks informed, I do intend to texture this model, as well as create the SUSAT scope and a version with a railed foreend. However, I won't have any internet for the next two weeks due to moving house, so progress may take a while. > **Posted by asteroidrules** > > Looking pretty nice, are you going to do other variations or just this L85a1? ill finish this one first, but maybe. > **Posted by Kaoclya** > > Nice job but I have no idea why you made the rear peep sights FoV so large, you did that with your AR's as well. clearer sight picture in not-real-life. folk can always scale it down if they like. 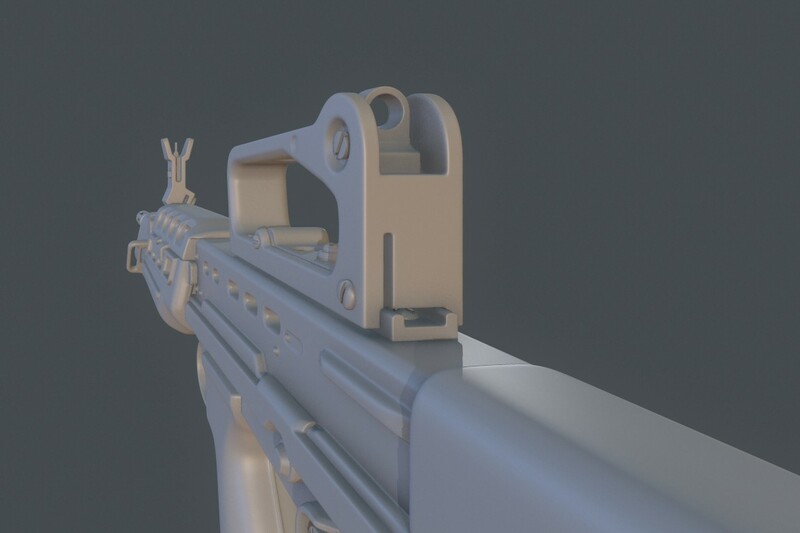 Looking pretty nice, are you going to do other variations or just this L85a1? Nice job but I have no idea why you made the rear peep sights FoV so large, you did that with your AR's as well. Hnggggggggg dat smoothness. Cant wait to see this bad boy textured! > **Posted by InnerConflict** > > boy, just watching k on the movie, everything going british and then suddenly a british and even my fav assault rfle pops up here. alright son you earned a new follower! a fan, a friend and maybe even....... a l...l...l....ovvv.er..... ^//w//^ no thanks. Saw this on CDG, great work!